What Is A Trigger Point (TP)? Chiropractic training includes many techniques to deal with muscle pain, which is also referred to as myalgia or myofascial pain. When pain is present muscles always go into a degree of spasm, this is a protective mechanism. So muscle pain is often not the primary problem but you still have to treat it to ensure a full and speedy recovery. The function of skeletal muscles is to give joints stability and to move bones. The brain and nervous system controls them giving co-ordination and purposeful movements. Did you know that there are around 600 muscles in the human body and skeletal muscles account on average for 60-70% of your body weight. So, it is not surprising that muscles are often a source of pain. When a muscle gets injured it is referred to as a strain. A strain is a stretching or tearing of muscle or tendon. A tendon is a fibrous cord of tissue that connects muscles to bones. Strains often occur in the lower back and in the hamstring muscle in the back of your thigh. A muscle strain is graded from 1-3 depending on the severity and a complete tear of a muscle, is called a rupture. There is a constant process of breakdown and repair in the body and most of the time the muscle injuries we get on a day-to-day basis are mild. The injuries cause small strains, so called micro-ruptures. A sprain on the other hand, is a stretching or tearing of ligaments — the tough bands of fibrous tissue that connect two bones together in your joints. The most common location for a sprain is in your ankle. Initial treatment for both sprains and strains includes rest, ice, compression and elevation. Mild sprains and strains can be successfully treated at home. Severe sprains and strains sometimes require surgery to repair torn ligaments, muscles or tendons. Following injury to a muscle, a “myofascial trigger point” or Trigger Point (TP) may form. This is a small area within a muscle, which, after injury, can remain for many years (long after the original injury has healed), and may cause chronic pain and stiffness. A trigger point is not an area of scar tissue from an injury. It is an area of increased sensitivity in the muscle. When pressure is applied to this point, pain is usually felt at a distant area, this is called referred pain. Trigger points can develop in any skeletal muscle, they are found in a specific area of the muscle and each muscle give referred pain to a specific area. To experienced hands a trigger point is felt as a nodule or taut band in the muscle or ligament. As chiropractors we diagnose and treat trigger points on a regular basis and they can be a significant source of pain. So what causes a trigger point? The injury to a muscle gives rise to pain, which in turn activates a spinal reflex mechanism. This causes localised muscle spasm, a decrease in blood flow, and an accumulation of the by-products of tissue damage. Adhesions then form in the muscle fibres, giving rise to the formation of trigger points (TP’s) which outlast the initial protective muscle spasm. Trigger points are most commonly the result of overuse or trauma: this may be acute, e.g. sudden overloading of a muscle when having to take an unexpected weight, or it can be gradual from chronic abuse of a muscle. This might be a repetitive strain, e.g. from typing, or from a postural problem such as rounded, hunched shoulders, or a weakness of the core stabilising muscles of the spine. Prolonged increased tension of a muscle due to a protective spasm from a facet joint sprain, can also be a cause. In addition, TP’s may be secondary to some other pathology that may cause pain referred to a muscle. For example, a peptic ulcer may lead to TP’s in the deep abdominal muscles, which may persist long after the ulcer has healed. TP’s are known to refer pain into other muscles, and this can lead to the formation of a fresh TP in the second muscle; thus trigger point pain can spread progressively through the body, usually in a downward direction. There is an individual variation in the tendency to develop TP’s: people of an anxious personality, whose muscles are already under chronic raised tension, and people who lead a sedentary life, are most likely to suffer. Several latent TP’s may be present in a group of muscles, and this is called an “injury pool”. This may remain latent for many years until an (apparently trivial) injury occurs, which rapidly activates all of them, giving rise to genuine and severe symptoms. In our chiropractic clinic we often see people having developed severe and persistent pain after seemingly trivial trauma. These people have often not been taken seriously by other physicians. But it is often explained by an activation of an "injury pool". How Do I Know If I Have Trigger Points? You may recall an injury occurring just before the onset of pain, (although frequently this will have been dismissed as too trivial), or you may identify one of the precipitating (or activating) factors described above. The pain arising from a TP may vary in severity, and there may be an underlying ache in the surrounding area (referred pain) or soreness in the muscle. The pain may be described as a burning or gripping pain, or a heavy, dull ache. TP’s may cause entrapment of underlying nerves, giving rise to neurological symptoms, e.g. pins and needles in the hand. TP’s frequently disrupt sleep as resting the muscle in a shortened position sets off the pain. Sufferers feel most comfortable when gently exercising the muscle. The diagnosis is suggested by the history and as part of the chiropractic examination the chiropractor will check for trigger points in the relevant muscles by using the hands and feeling for lumps and bumps in the musculature. They are easy to find when you know where to check and how to do it. When the chiropractor puts pressure on the point it will often elicit tenderness and refer pain into a distant part. The area of referred pain will depend on which muscle is involved. A palpable band may be felt in the muscle and the most sensitive part of this is the TP. Tweaking it (like plucking a guitar string) may produce a twitching of the whole muscle. The chiropractor will usually compare to the pain-free side as some people are normally tender; it is abnormal tenderness that indicates a TP. 1. Treating Trigger Points using pressure - The most common method for chiropractors is to apply pressure to the TP using the finger or thumb. This is a very effective way of treating TP’s, it also allows the chiropractor immediate feedback how the muscle is responding. The chiropractor applies the pressure for a few seconds until the TP disappears, or ‘melt’, and the muscle relax. This is followed by massage. This procedure may be repeated during one treatment if the TP is severe. This is the least invasive technique and is usually the first choice. 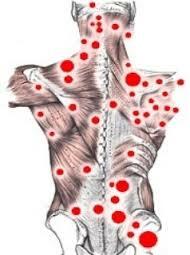 Home treatment of trigger points can also be given. You can use a small rubber ball to lean against to apply the pressure to the trigger point. 2. Treating Trigger Points with Spray-Stretch Technique - This involves having a cooling agent sprayed onto the muscle followed by stretching. This technique was initially suggested by Travel and Symons but we rarely use this method, because it is not always practical if movement is restricted. The duration of dry needling can vary from less than a minute up to 10 minutes, but largely, inactivating TP’s needs only brief needling if they are accurately located. It is only necessary to use one needle per TP. For some patients this is a better option as it can be more comfortable than using finger pressure. If the chiropractor finds that you have trigger points during the examination this will be part of your chiropractic treatment. It is extremely rare for anybody to have trigger points in a muscle without any underlying joint problems relating to the spine, so the number of treatments needed depends on your condition. However, the number of treatments needed to deal with the trigger points are usually less than the overall course of treatment. But for more chronic problems it is necessary to do trigger point work for a longer period of time. In acute cases of myofascial trigger point pain, TP’s can be readily deactivated in one to three chiropractic treatments. TP’s seem to become more resistant after about 6 months, and chronic TP’s usually need prolonged therapy and exercises, alongside your Chiropractic care. The correction of hormonal, nutritional and postural problems may also be an important part of treatment. The frequency of visits is determined by your problem and how quickly you respond to the chiropractic treatment program. Generally, dry needling sessions begin with one a week. In some acute cases it may be necessary to repeat treatment quickly so that each treatment builds on the effect of the last.